From a small trap door, they made under one of the large windows between the ribs of the great dome of Hagia Sophia we stepped out to face a magnificent view of the area. As I stepped out, I was looking at the Blue Mosque at the level of its minarets and I could see the Sultanahmet district, the Hippodrome, the Marmara Sea, and beyond. The view was breathtaking. You will see a panoramic view that will give you an idea of what hit me. I felt like creating a section of it in the style of gravure printing and hand coloring as a tribute to the artists who might have painted from this angle centuries ago. 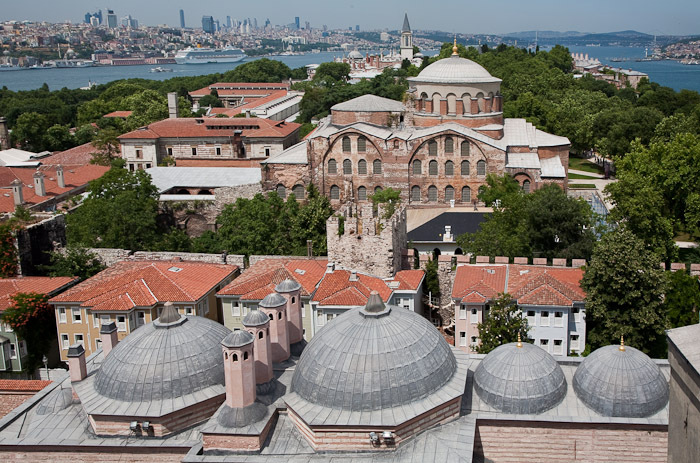 Looking around, you will see many domes extending from Hagia Sophia, its minarets, ornaments that adorn the tops of domes and minarets glittering in the sun. The weather was great, sunny but with a decent cloud cover to soften the light. Without the clouds, most of the photographs would have been far too contrasty as we stepped outside probably around 1:30-2:00 pm in June. Now, that’s strong sun. There were crows flying all around, some perched on the edges of the buttresses of the church as if to pose for me. They also flew in great number around one of the minarets. Their numbers would increase or decrease as if controlled by some trigger event. When I saw them flying all around, the feeling of the size of the flock is much greater than what a single photograph may record at high-speed. 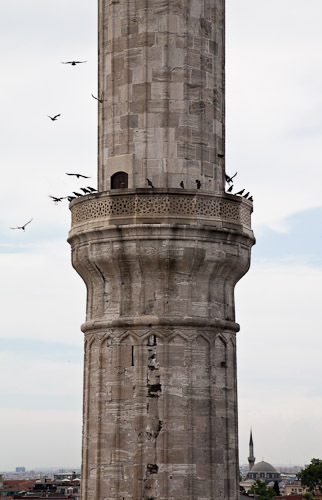 The two photographs of the crows flying around the minaret are the result of combining several photographs taken in succession. But the feeling of a large number of crows is very real and true to what I felt at the time. After I photographed on the side facing the Blue Mosque for about an hour or so, Erdinc asked Reha and I if we would like to walk to the other side. Reha passed the opportunity knowing the passage was a narrow roof-line. I did not want to miss the opportunity to see what the other side offered and accepted the challenge. You will see the roof section I walked to get to the other side. Two people like me would find it difficult to walk side-by-side there. The view from there overlooked the fountain outside the great entrance of the Topkapi Palace. The view was equally breathtaking from that side, seeing Hagia Irene and Topkapi Palace behind extending to the sea. I photographed there for a while and then Erdinc walking in front and me looking straight at him, I walked back to where we started. All good things must come to an end, so several hours after we entered the church, we stepped inside and took the elevator down. 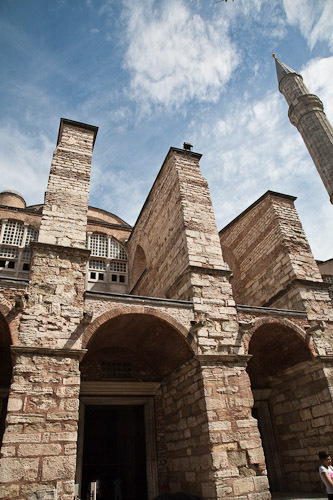 Now, take a look at what I experienced from the roof of Hagia Sophia. What a thrilling experience!